I will have to ask for your definition of 'Hog Killers'? A person who kills hogs? NFL teams that defeated the Washington Redskins by overpowering their offensive line. Say between 1981 and 1995? "Caesar si viveret, ad remum dareris!" I like your well reasoned post. I think you broke TAM's record for lengthiest. My friend TAM could beat that (and has) in his sleep! He is a well respected and prodigious contributor here as well. Though I've been a member 3 years longer....TAM has about 15,000 more posts than I. My first contact with Chris was many years ago on another forum (some hunting site I don't remember). He had posted something about Concealed Handgun Licencing that contained a minor error...and I invited him to join us here at that time. He did and the rest is grateful history. Spartans ask not how many, but where! I wasn't knocking him, but doing a bit of tongue in cheek regarding your rather lengthy and I think excellent post. Now, he'll probably post a micro-novella just to shut us both up! I wait (cringing) to see it. Yes, we knew that. TAM will take no offense (as none was put forth). But he's not a person you would want 'after' you. Oh yeah, put em up! Said the cowardly lion as danced around with his dukes up! My Older Brother came up to visit for a few days; he has been playing around with his new Ruger Precision Rifle in 6.5 Creedmoor. Has a nice NightForce scope on it. Been ringing the 8” gong at 1000 yds. with it. Said he wanted to try it out on some hogs. So happens I had a group of 7 hogs tearing up a pasture. So we set up a hog light this morning, put out some corn, set up a portable table on top of the dam overlooking the pasture, got a couple chairs set out. Plan was to let him pick a hog, do a countdown (3,2,1, fire) and we would both shoot. I was using my daughter’s 7mm-08. Range 240 yds. 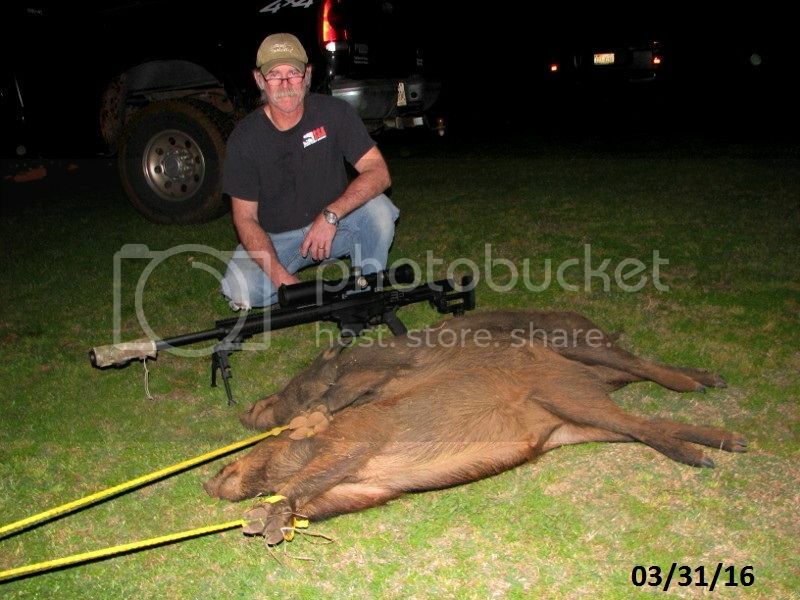 Hogs showed up dutifully right at dark. We waited and waited for two to get broadside at the same time. Finally, got a couple of pigs to oblige us. Mark jumped the gun on the countdown cadence a bit, so rather than us firing simultaneously…my shot followed his. Problem with that is… we were just about elbow to elbow and shooting off the same table. At his shot….I completely lost my sight picture due his muzzle flash (his barrel way out ahead of mine on the table). I sent a bullet their direction anyway. Heard his bullet hit, did not hear mine. Immediately grabbed up the spot light and told him jack in another round. One of the pigs was running straight at us. He couldn’t see it because I was backlighting his scope (silly me), so I moved out in front and to the side of him a bit. Second hog taken on the run at about 150 yds. Not big hogs by any means, but a fun time spent with my Brother! And a good time was had by all (except the hogs, of course). Sorry I was so long winded in this reply.